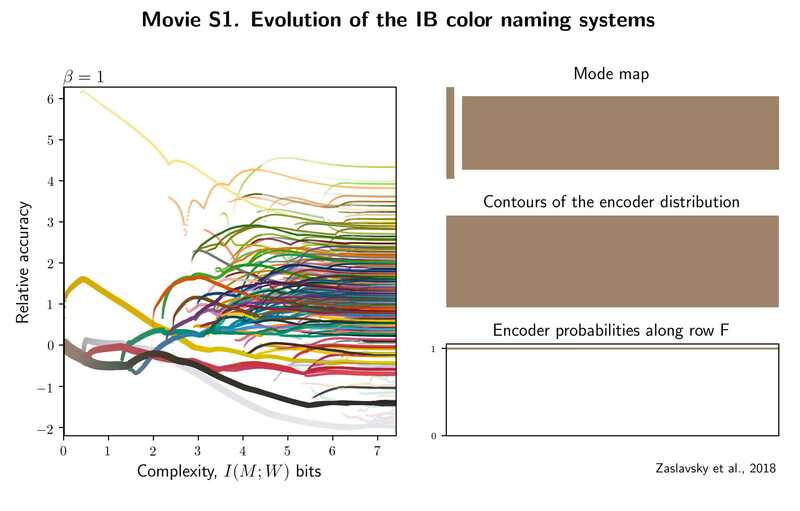 Evolution of the IB color naming systems. Left panel: Bifurcation diagram, similar to Fig.5. This diagram shows the full range of IB solutions, whereas Fig.5 shows only the range relevant for the languages in our data. The black line indicates the location in the diagram that corresponds to the value of β. Right panel: Visualization (as in Fig.4) of the IB system that corresponds to β. The IB systems evolve as β gradually increases from β = 1, where there is only one category, to β = 213, where each color is mapped deterministically to its own unique category. In between these two extremes, the IB systems induce soft color categories. Structural phase transitions occur at critical values of β along this trajectory of efficient solutions, in which new categories appear. Low-consensus regions often appear in systems near these phase transitions.